There is a common understanding of what strategy is across the organization. 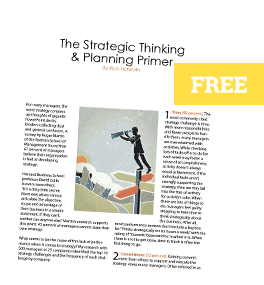 The majority of managers can clearly define and differentiate strategy from other planning terms. We have mission, vision and value statements that influence people’s daily behavior. People do not engage in multitasking when in meetings and teleconferences. Fire drills and reactivity are not common characteristics of our culture. Our products and services have differentiated strategies that lead to competitive advantage. Our culture rewards risk taking in the pursuit of differentiated strategies, even when it results in failure. People are always willing to push out of the status quo to evolve and change when it’s in the best interest of the business. We make modifications to our business model on a regular basis to stay ahead of the curve. Meetings and teleconferences in our organization are both effective and efficient. Different functional groups meet on a regular basis to discuss each other’s strategies. We seek different perspectives and challenge assumptions when making decisions. We have a plan that is no more than 1-2 pages in length and drives our daily activities. Our team focuses on the most important 1-3 priorities and deprioritizes everything else. Each group’s strategies are aligned with the other functional areas on a regular basis. When we use SWOT Analysis as a planning tool, it produces actionable strategies. Each team in the organization creates its’ own distinctive strategies. We are effective and efficient when it comes to strategy execution and communication. Strategy conversations occur on a regular basis and are effective in gaining buy-in. Our culture supports strategic trade-offs and saying “no” to non-essential tasks.